Summary: Long ago the animals & other inhabitants of Earth (the oceans, the rocks, etc.) argue about God. Each animal gives God characteristics like themselves. The wind argues that God is never still. Then the rock insists that God never moves. The lion describes God as a hunter; the robin claims that God is gentle. 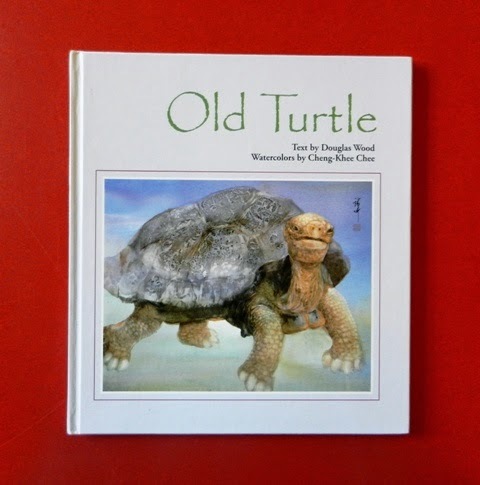 Eventually wise Old Turtle stops the arguing, offering a description of God that incorporates all the previous ideas and ending simply with “God is.” Old Turtle forewarns of a new animal coming who would be even more like God. Humans do come, but they forget to be like God. When the humans argue about God, they use their power to hurt others and the Earth. A new response comes from the other animals. They declare God’s presence in a variety of ways. After a lonely and scary time, the people listen and even begin to see God in one another and the beauty that surrounds them. Old Turtle and God smile.